Compounding the economic recession and stagnation are the hundreds of millions of dollars that jurors in an American court this week ordered the PLO and PA to pay compensation to Israeli-American victims of Palestinian armed attacks; the danger that the Israel Electric Corporation will continue to cut off electricity intermittently; and the flooding in Palestinian neighborhoods in Hebron and the Gaza Strip due to recent storms. All this comes on top of the emotional and physical destruction in Gaza, whose reconstruction seems farther away than ever. Establishment of the PA relieved Israel of fulfilling its obligation to look after the needs and well-being of the residents of the occupied territories. Israel was not, however, relieved of its obligation according to international law, because the Israel Defense Forces constitutes the sole sovereign authority in the West Bank until today, and effective control over Gaza has remained in the hands of Israel since 2005. At the same time, since the creation of the PA, Israel has blocked its access to resources that would allow it to fulfill, as a subcontractor, the duty of the occupier to look after the needs of the occupied. This is an entity that has to function without 62 percent of its territory, without control of water resources and the electromagnetic spectrum, without any control at borders and over population registry and citizenship rights, without freedom of movement, and without any control over the fate of existing and potential revenues – from customs duties, exports, mining, fishing, expanding industry or agriculture. For all their shortcomings, the Palestinian security apparatuses, he added, “maintain internal security within Palestinian society. They restrain and quash conflicts between clans and other groups, which tend to proliferate in times of crisis and of a loss if faith in the political system.” It is sufficient to look at the difference between Area B, in which it is forbidden for Palestinian police to operate, and Area A (which is under full Palestinian control): The Palestinian police cannot enforce laws in Area B (in locales including A-Ram, Abu Dis or Kafr Aqab), where illegal construction that violates safety regulations and rules runs rampant and criminals find refuge. If because of the economic blows it is suffering the PA would dismantle itself – along with it the police and internal security apparatuses – rival armed militias representing opposing clan interests would fill the vacuum. 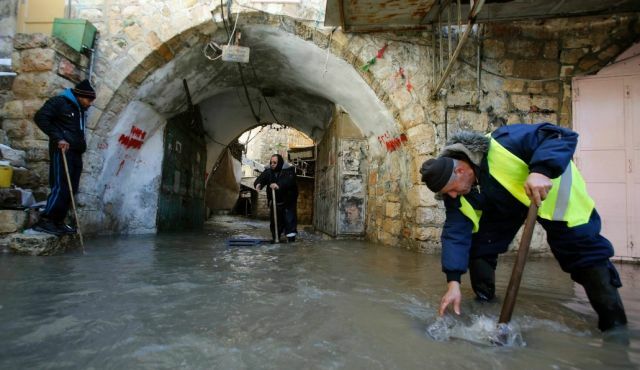 Like the sewage in Gaza, which goes untreated because of Israeli restrictions and ends up on Israeli beaches, so would the deterioration of internal Palestinian security not stop at the borders of Area A enclaves. There must be some Israeli politicians in Jerusalem who get that.